Like all holidays, this one seems to have flown by and we are already on our penultimate day. Unlike a good few of our recent May holidays in North West Scotland, when it has been fine and warm, this year, it’s been quite wild and very cold for the whole of the two weeks. That said, I think we have seen a bit of the sun most days (in between heavy rain and snow showers) but what sun there has been hasn’t threatened to burn my increasingly balding head… the sun hat was removed from the rucksack at the start of this week. 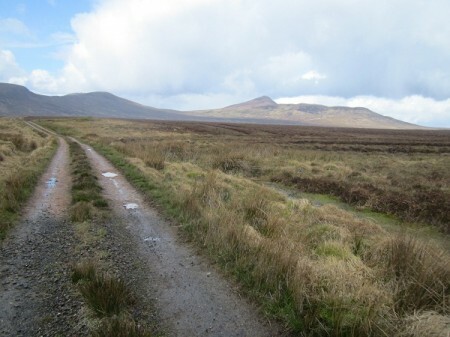 We had just such a day yesterday, when we drove south into the Flow Country to walk Ben Griam Beg. Last weekend we had tried to walk this hill and its neighbour, Ben Griam Mor together, but after walking the latter, we were unable to get over to Ben Griam Beg – a rather over full small burn stopping our progress. Yesterday, we approached the hill from a different direction, thus avoiding the problem stream. We left Kips Cottage in bright sunshine but as we arrived at our start point the sky became very dark and the temperature dropped several degrees and it started snowing. After waiting for about half an hour the skies lightened and we set off before Nita could eat all of her sandwiches! 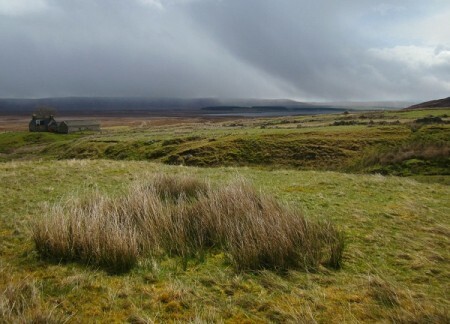 The first part of the walk, across the open, flat bog, was along a dirt track leading to a remote little house, perched beneath the hill. The sun came out on several occasions as we walked through this wild landscape and with the big skies and the bright colours, I think I should have plenty of new material for future paintings. Beyond the cottage, it was simply a case of striking uphill, to reach the long, broad stone and heather covered ridge and then up the final few hundred feet of steep ground to the summit. Easy really, but then the skies darkened again, the wind picked up, and we found ourselves walking into quite heavy snow. Thankfully, there were a few spots to shelter and we sat with our backs against a rock for half an hour or so until the snow eased and the thick cloud lifted. 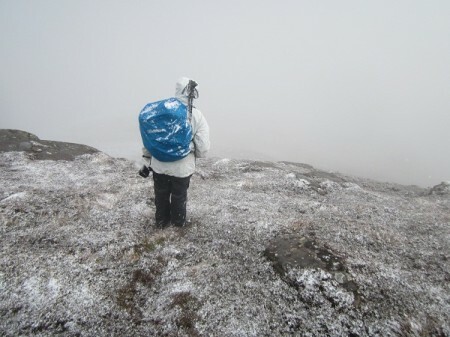 We set off again, but almost immediately walked into another heavy snow shower, but carried on regardless, as we clambered up the final steep slopes. It was exceedingly cold and very quickly the ground was turning white. 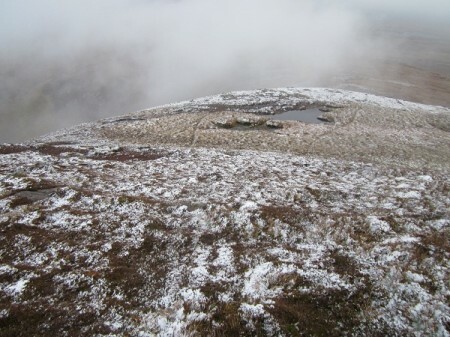 Stood on this lonely little summit in these conditions made me realise that despite its modest height of 580 metres, this was quite a serious hill walk. 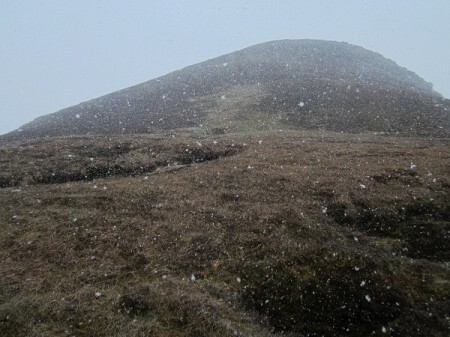 Ben Griam Beg is, according to the guide books, the site of Scotland’s highest hill fort and remnants of the walled enclosure still exist but with the snow still falling and no sign of a let up, we decided rather than looking for the fort, it might be more prudent to head back down. Of course, half an hour later, the snow stopped and the cloud lifted, so another year we may have to come back and search out the fort. This was a proper mountain walk and made for a great day. Recommended.